Anyone wanting to hear the new David Bowie can do just that. The singer has placed all 53 minutes of The Next Day, his first album in a decade, on iTunes‘ streaming service. Despite a slew of favourable reviews, until now fans have only been able to hear Bowie’s two comeback singles, Where Are We Now? and The Stars (Are Out Tonight). In general, the album follows the template set by the latter song – more often upbeat and rocking rather than somber and contemplative. The album, the singer’s 24th, will not be available to buy until its official release date of 11 March. However, the stream will remain up until that time here. 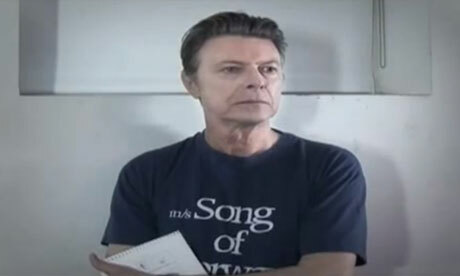 This entry was posted in David Bowie and tagged davidbowie, gerryleonard, news, spookyghost, thenextday. Bookmark the permalink.